Motorola, just like with Moto G, is selling the Moto E in a very tiny retail box, which houses only the phone itself and a USB cable. There is no wall charger, nor is there a headset. Whatever you need more, you'll have to buy one. Surely, the retail package contents may vary across different markets. In our case, we picked up our Moto E from a retail store in the UK so our observations would certainly be valid there. 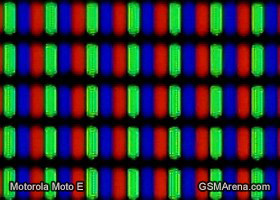 Moto E spreads at 124.8 x 64.8 x 12.3 mm and weighs 142g - a footprint very similar to Moto G's but 5mm shorter and a gram lighter. 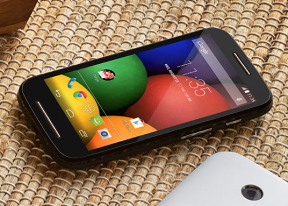 Motorola Moto E utilizes a clean, simplistic design, which however lacks any character whatsoever. That's not to say that the Moto E is bad-looking, but it completely fails to grab the eye in any way. The entire front is covered by a protective glass, and in Moto E's case that's the latest generation Gorilla Glass 3. The removable rear cover is made of matte plastic which isn't prone to fingerprints and smudges. Finally, there is the glossy framing bordering the display, which might not be helping for a good grip, but surely looks nice. Unfortunately, the Moto E build quality is not up to very high standards. The different parts and panels just don't seem to fit like it should. The rear cover, for instance, fails to fit the middle section properly and not only does it give out the occasional creaks and squeaks, but it also moves around a bit under your fingers, which leaves a rather cheap impression. A second example is the way the middle section fits around the front panel. The translucent frame we mentioned earlier has a substantial gap that allows all sorts of dirt and whatnot enter there and it's a rather tricky place to clean. Being a 4.3" smartphone puts the Moto E in the pocket-friendly category. It isn't thick or bulky, yet its 142 grams would have made for a solid feel in your hand if it wasn't for the flimsy battery cover. The Motorola Moto e 4.3" qHD display isn't among the best units we've seen, but it's certainly among the best this price bracket has on offer. The pixel density is 256ppi, which qualifies for a sharp enough images and easy reading. The display is not that bright, but to make matters worse, its surface is very reflective. The viewing angles are good with acceptable color washing, though the reflectiveness gets in the way of the viewing experience if you are not looking at the screen straight on. Disregarding the effect of the reflectivity, the display panel's contrast turned out very good thanks to the deep blacks. As we said, the Moto E's display is very reflective and you'll have a hard time in those sunny days.